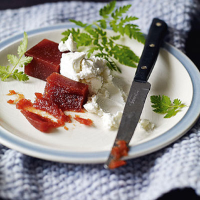 This is delicious served with a soft goat’s cheese, stilton or crozier blue cheese. Preheat the oven to 100˚C/gas ¼. With a cloth, rub the down off the skins of the quinces. Pack into a large casserole, but do not add any water. Cover the pot and place in the oven for about 4 hours, until the fruit is easily pierced with a skewer. Quarter the fruit, remove the core and any blemishes, and put the pieces through a moulin à légumes, using the biggest disc. If you do not have one, buy one! Failing that, push through the holes of a coarse sieve with a spatula. Weigh the quince pulp and add three parts sugar for every four parts of pulp. This quantity should produce about 1.6kg quince pulp, which requires 1.2kg sugar, but adjust amounts accordingly. Cook the mixture in a preserving pan or large, shallow saucepan over a medium heat for 15–20 minutes, stirring continuously with a wooden spatula, until the mixture becomes rich in colour and no longer runs together again when the spatula is drawn through the mixture. Line two swiss roll tins (23cm x 30cm) with baking parchment, fill with the paste and leave overnight to get quite cold. The following day, preheat the oven to 110˚C/gas 1/4 and dry the tins of paste out in it for about 4 hours, until it is quite firm. Check it is ready by lifting a corner of the paste: it should be solid all the way through. When the trays of paste have cooled, cut each into four strips, wrap in baking parchment and store in an airtight container. It will keep for about 4 months in a cool place, but is best eaten when freshly made. Cut into squares to serve as a sweetmeat. Try a dry oloroso here to match the cheeses as well as balancing the strong, herby leaves and sweet fruit flavours. Waitrose Solera Jerezana Dry Oloroso Lustau Sherry. Bin 64522; £7.99.